…We went live with some web sites over the weekend. First up is iCandy, which was formerly Accent on Hair and Beauty. iCandy is a beauty salon and spa in Bristol, UK. iCandy is one of our longest-standing clients and wanted a revamp to reflect the new direction and rebranding of the salon, and also introduce an online store (which will be added to the site in October). The biggest challenge was to present a whole bucket load of information (see the text only version for the sheer amount of text involved with such a site) without being overwhelming. We achieved this by building the site in Flash and using pop-ups to present the information, with images. Using Flash also allows us to build a site which looks “alive” and highlight some beautiful images. 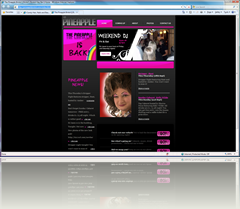 The second site is the new web site for The Pineapple, a bar and entertainment venue in Bristol, England. The site was interesting as we needed to build in the ability for the management to update the events diary, the news stream and also a photo gallery. And, we needed to do this on a small budget. We turned to a few open source options, and embedded them through RSS. The photo galleries are built using Silverlight 2.0, and pulling in photos from an RSS feed. 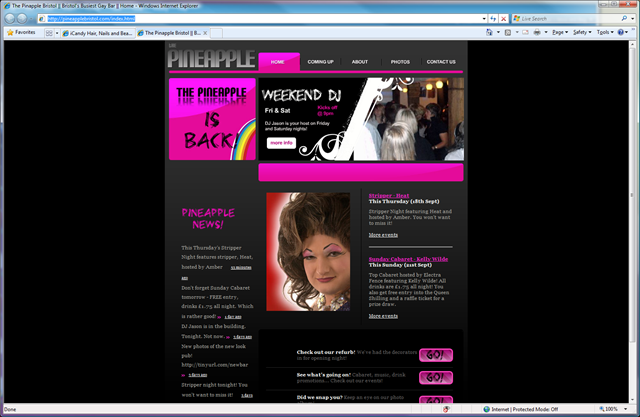 The end result is a constantly changing web site, highlighting the weekly events and, through the photo wall, highlight the fun atmosphere of The Pineapple. And everything can be updated by the management.